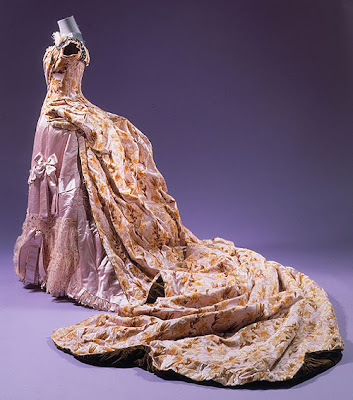 Making an 1888 Evening Gown? My dear friend, Rosie, lives in Pittsburgh, where Vince and I will be moving at the end of the summer. She is an avid costumer, like myself, and we are already both scheming about what fun dresses we'll make together. Two autumns ago we participated in an "immersion" event in Gettysburg set in the year 1888 - the soldiers who fought at Gettysburg were coming back to visit. All participants had to stay in character the entire weekend. It was our first immersion event, and we had a BLAST! 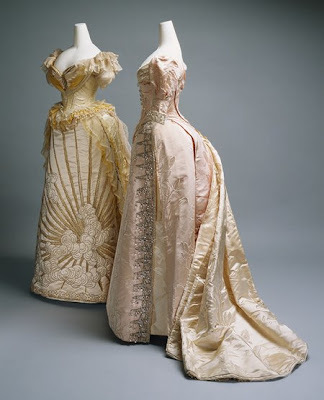 So, in honor of the fun we had together dressing in 1880s clothing, we'd like to make bustle dresses to wear to the Opera in Pittsburgh for sometime this winter or spring. Here are a couple images I'm looking at for inspiration. My 1888 day dress was made from the pattern for an 1887-89 dress from the book "Patterns of Fashion 2" by Janet Arnold (p.38). For a ballgown I'd like to reproduce the style of the dress in "Costume in Detail" by Nancy Bradfield (p.251-254) c.1885-87 Wedding Dress. I'd like to make mine of red-purple changeable silk taffeta. For the pattern I'm considering the 1880s Evening Bodice Pattern (p. 120 C. Evening Bodice) from "Period Costume for Stage and Screen" by Jean Hunnisett. The c.1886-87 Skirt pattern (p. 127 D. 1886-87 Skirt) is also quite pretty. 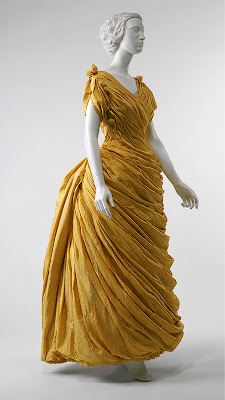 My 1888 Day Dress had a built in bustle, like the original in the "Patterns of Fashion" book. It worked out quite well. It held its shape perfectly, was lightweight and very easy to add to the skirt. 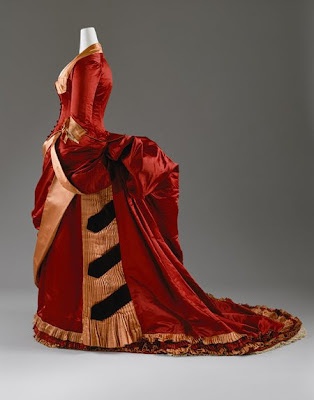 I may consider making a built in bustle for the evening dress as the original in "Costume in Detail" was made like that. Mmmm....I think this one's really LOVELY! Isn't that yellow dress amazing? No trim to de-emphasize all those pleats going on. Pure simple draping. Just brilliant. Good luck with your project! Jennifer - Yes, that yellow dress is just stunning! It would probably be pretty time consuming to reproduce something like that!